Kazuo Ohno passed away on June 1st at the age of 103. At his death, he was surrounded by the family members and students who cared for him for the past several years. 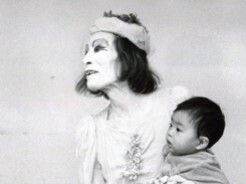 Many of Eiko & Koma's audience members may have seen him dance or have heard Eiko & Koma talk about him. He is one of the most influential artists in dance history. and beyond. A memorial service will be held this week in Yokohama, Japan. The event is diffused via Usteam. We encourage you to write to kazuo_ohno103 [at] kazuoohnodancestudio [dot] com to share your thoughts on this occasion and join Eiko & Koma in celebrating his life and art.